This room is the first point of call for new members to the Hospes Lategum. Here you will find the Hospes Lategum Collar and HUD, which contain several features enabling your transition into a Zeta. The female and male Hospes Lategum Zeta uniforms are also available here freely. 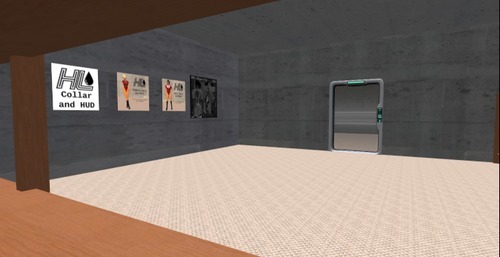 You will need to be a member of the Hospes Lategum Secondlife group in order to take a copy. The MD Prisoner Suit is available here for L$300, and is required to participate in meditation.